Affidavit allegedly signed by three (3) distinctly different persons with one only SINGLE SIGNATURE. Address of the deponent in this affidavit is incomplete without a house or street number which makes this affidavit an invalid court document. A copy of a 1965 episode of the vintage Mavis Bramston Show obtained from the Australian Film Archives in Canberra features an actor by the name of GORDON CHATER who smashes eggs and tomatoes followed by a cream pie on top of his head and face and then uses a soda siphon to wash up the entire mess ... Was that the kind of humour depicted in "Crocodile Dundee" ? CERTAINLY NOT !!! It is said in comedy circles that a person's particular style of humour is as unique as a set of finger prints or DNA. Isn't it true that the vintage Paul Hogan Shows not only had a lot in common with the Benny Hill Show but also with the comedy style of "Dave Allen" who sat on a stool to deliver his lines. According to the Hallywell's nomenclature, the "Phantom" was an original work for a black and white film that dates all the way back to 1943. The screenplay for this particular film was still protected by copyright laws in 1989 when it was alleged the screenplay for another "Phamtom" film was "written" according to Encore - i.e. 46 years after the original work had been created in 1943. Copyright for an original creation subsists for 50 years after the first publication of the original creation. No listing in the Australian Writer's Guild under the exact name of "Kenneth George Shadie". Ultimate proof that "Kenneth George Shadie" is an exact name which doesn't exist and certainly did not exist in May 1984 as a real person in material form - i.e. as a real person made of flesh and bones. The TRUE AUTHOR does not need to rob a bank to recover his ROYALTIES. His ROYALTIES were legitimately earned (albeit in fiduciary form) when his ORIGINAL ARTISTIC WORK for the film “Crocodile Dundee” was EXCHANGED for them (his ROYALTIES) since May 1984. Please make a note of the BOWLER HAT that the true author portrayed as "Ben Doyle" is wearing when Lightning Jack and he decide to deposit Ben's legitimately earned royalties in the "safest" bank in the State. The exact amount of the true author’s royalties could not be calculated in May 1984 because the future earnings of the film at the box office could not possibly have been known at that point in time … i.e. BEFORE the film was actually produced and exhibited worldwide. Every income earned in Australia consists of (1) the TAX PAYABLE component and (2) the BALANCE owing to the Income Earner/Taxpayer. No income earned in Australia could possibly be TAXED at the TAX RATE of 100 percent !! Please make a note also of the metaphorical analogies incorporated in the story line for the film “Lightning Jack” in the above video clip, where the said metaphorical analogies can be appropriated to the amendments made to Australia’s IP Laws (in 2000) by the Federal Government of the day. The reaction of the Lawyer referred to me by the Law Institute of Victoria. The author's use of Heuristics since May 1984. The Hon. Steve Scalise of Louisiana is certainly aware of what can be achieved with the use of the Algorithms of Computer Algebra. The above video which depicts Republican the Hon. 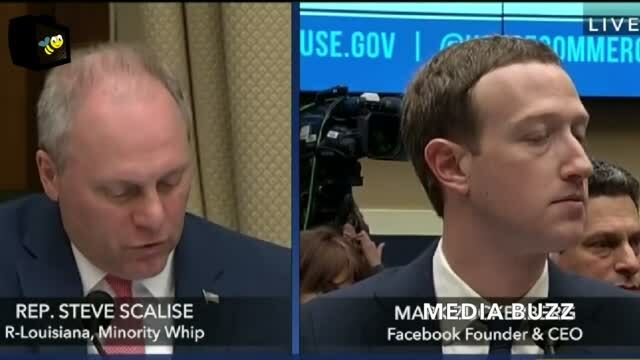 Steve Scalise – Minority Whip from Louisiana – questioning Marc Zuckerberg about the nature of the algorithms of computer algebra that Facebook utilizes, demonstrates that American politicians – UNLIKE AUSTRALIAN LAWYERS – are not only AWARE of the existence of the algorithms of computer algebra, but are also AWARE that the algorithms of computer algebra can be utilised to identify individual people worldwide by means of their likes and dislikes, as well as by their other minor characteristics with pin-point accuracy. In May 1984, I devised an analytical method that I had intended to use in the future to identify myself as the true author of an original artistic work which I had created at that same point in time, for a very successful film that was planned for production in 1985 and exhibition worldwide two years in the future (i.e. in 1986). My reason for doing so was suspicion at the time of the possibility that I would be denied my royalties entitlement for my creation of the original artistic work, on account of the unconventional manner that had been employed to record the said original artistic work. The work was recorded on a magnetic tape recording device instead of the conventional manuscript in hard copy written form. As the title suggests, a PLA was designed to be carried out by means of an assessment of the nature of the words which are used by anybody and everybody in speeches, screenplays, court transcripts and court documents, as well as in written media publications. When I was denied my royalties (as I had anticipated all the way back since May 1984 would be the case in the future) there was a need for me to take my grievances (i.e. the relevant IP dispute) to the Federal Court in Melbourne, Australia, for adjudication. I then successfully used the same analytical method that I had devised since May 1984, to establish that the judgement issued by the Federal Court in Melbourne Australia, was not only flawed and contained very little substance, but also that it contained elements of perjury and perversion of the course of justice on the part of the lawyer representing the respondents. It needs to be noted on the other hand, however, that mainstream media in Australia deliberately places a bias in the same kind of algorithms that they use to control (by filtering) public feed-back to articles they publish and share on Social Media, to block user comments that are inappropriate, offensive, rude, or of adverse opinion etc. … but most importantly, comments that denounce with evidence in support that the subject matter and/or part of the content of the articles being published by mainstream media is/are fallacy/fallacies. Application of the Australian Copyright Act, 1968.
Who is the person named "Anger"
Do you know the person named "Anger" who is trying to justify the act of stealing ? In the modern and real world, a man without material wealth CANNOT be loved, and in reality is in practice NEVER loved. The reason for this is simply because a man without material wealth has nothing to exchange for what is "said" to be love. Some rich people say that "Money cannot make you happy" ... and yet these rich people DO NOT GIVE the money that they have stolen BACK to the person who God had intended to legitimately have this money since birth ... by giving this person outstanding artistic talents (at birth). Why do these rich people keep what PRECISELY is making them so UNHAPPY ?? The lyrics of the song titled "Affirmation" by Savage Garden contains the appropriate words in the lyrics : "I believe the only ones who disagree are millionaires". According to recently conducted polls, the LACK OF WHAT DOES NOT MAKE PEOPLE HAPPY is certainly the current cause of many people's misery ! Is it EASIER to raise taxes and inflate the cost of utilities to increase revenue, rather than ALLOW productive and artistic people to generate phenomenal amounts of money through the influx of foreign currency ? Why take this course of action when the phenomenal amounts of money that artistic people normally generate would -- ultimately -- benefit the entire nation ? How many people approve of the unpopular ideology of robbing Peter (who is considered to be financially comfortable) to pay Paul who is considered to be poor ? I own the copyright in the lyrics as well as in the music for the above song performed by Savage Garden. How could I possibly be prevented from enjoying the freedom of publishing my own work on my very own website ?? Please refer to page titled Rule of Law.